Dey Street Books, 9780062269003, 432pp. From the veteran New York Times bestselling biographer comes a major, in-depth look at one of the most enduring American icons of all time, “the Duke,” John Wayne. As he did in his bestselling biographies of Jimmy Stewart and Clint Eastwood, acclaimed Hollywood biographer Marc Eliot digs deep beneath the myth in this revealing look at the most legendary Western film hero of all time; the man with the distinctive voice, walk, and demeanor who was an inspiration to many and a symbol of American masculinity, power, and patriotism. 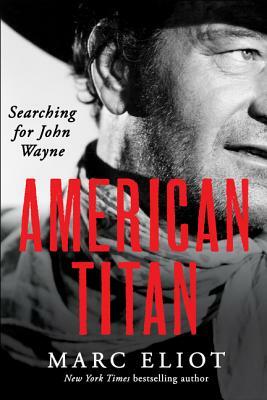 Eliot pays tribute to the man and the myth, identifying and analyzing the many interesting contradictions that made John Wayne who he was: an Academy Award-winning actor associated with cowboys and soldiers who didn’t like horses and never served in a war; a Republican icon who voted for Democrats Roosevelt and Truman; a white man often accused of racism who married three Mexican wives. Here are stories of the movies he made famous as well as numerous friends and legendary colleagues such as John Ford, Maureen O’Hara, Natalie Wood, and Dean Martin. A top box-office draw for more than three decades—starring in 142 films from Stagecoach and True Grit, for which he won the Oscar to The Quiet Man and The Green Berets—John Wayne’s life and career paralleled nearly the entire twentieth century, from the Depression through World War II to the upheavals of the 1960s. Setting his life within the sweeping political and social transformations that defined the nation, Eliot’s masterful portrait of the man they called Duke is a remarkable in depth look at a life and the “American Century” itself. Marc Eliot is the New York Times bestselling author of more than two dozen books on popular culture, among them the highly acclaimed Cary Grant, the award-winning Walt Disney: Hollywood’s Dark Prince, and American Rebel: The Life of Clint Eastwood. His work has been published in more than twenty-five languages, and he writes for a number of publications and frequently speaks about film to universities and film groups, and on radio and television.